I have dry acne prone skin. Using this for 4 months I haven’t really seen any amazing results. I notice when I use it on my skin I break out, so I use it underneath my eyes because that’s where I am most concerned about wrinkles because I already have fine lines. I’m 19 so I feel like this is useful for those in there late 20s and up where people will actually see a huge difference. I was hoping it would make my fine lines under my eyes less noticeable but it didn’t. This is a night serum designed to combat various causes of ageing and improve the appearance of fine lines and wrinkles through a dual peptide formula strengthened by EGF and bFGF. These two ingredients are produced by the body, but the concentration decreases after we reach our mid 20s. They are key factors in keeping the skin smooth and elastic. This serum is meant to help make up for the lower production and help keep the skin firm. These are the two main ingredients, there are only 8 more, most of which focus on anti-ageing. It's a very lightweight runny serum that is blue in colour. It spreads out easy and sinks in fast. I’m definitely not 25 anymore, so anti-ageing is something I’m trying to pay more attention to! Unfortunately I broke out slightly when I used this serum on my whole face, so I decided to just pat it on around my eyes and between my brows, where it doesn’t bother me. That’s a shame but my skin is difficult. After a few months I can see some improvement, the skin around my eyes looks a little brighter and a little plumper. The effect is very subtle though, the lines aren’t going anywhere. The serum is more preventative though, as most of anti-ageing products are. It does however do a nice job at improving the overall look of your skin and it feels quite soothing. It’s definitely a nice product in your anti-ageing routine. Shame my whole face doesn’t like it, but I do enjoy using it as an eye serum! Currently on my second bottle of this. The ultimate pair of this Midnight Blue drop is the Vitamin C drop. You'll get a fresh and plump skin the next morning (You would want to use this at night). I use this one every night and mix it with the Vit C drop every other night or 3 nights. I bought this for early prevention since I'm at my last 20s. For extra moisture, can use the cream after you apply and dab this onto your skin. I love Klairs Midnight Blue Calming Cream (review here) ~ I love this little pot of calming azure blue cream that helps soothe and repair blemishes and other skin issues. I am currently trying out the Mid-day Blue Sun Lotion SPF40/PA++, another product that has the blue guaiazulene ingredient, but it wasn’t until a few months ago that Klairs came out with a third product in their Blue line ~ Klairs Midnight Blue Youth Activating Drop. This is an anti-aging serum and when I saw the sneak peek on Wishtrend’s feed, I had been waiting for it to come out. 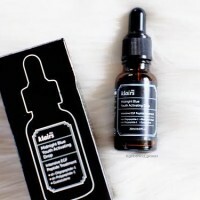 I was lucky when Wishtrend asked me to review this serum and I actually have used all but a few drops in this bottle by the time I wrote this review!! I have reviewed several Klairs products by now, and I have really enjoyed all of them ~ you can read my reviews here. Skin Type/Concerns: Oily, blemish prone, aging skin with hyper-pigmentation and fine lines/wrinkles. ￼ image source On a deep blue night, only the sweetest dreams for your skin. The KLAIRS Midnight Blue Youth Activating Drop does exactly what it’s named after. 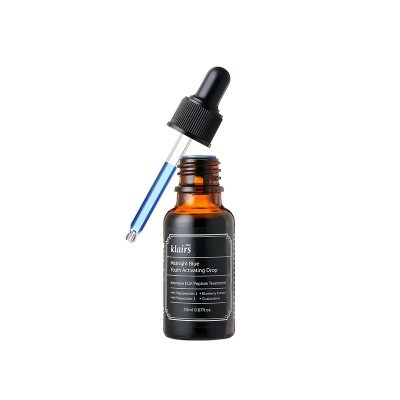 It is a night serum used before going to bed that has a blue tint due to guaiazulene in the formula. Made with EGF (rh-Oligopeptide-1), bFGF (RH-Polypeptide-1) and 95% raw materials for anti-aging effects, the EGF and bFGF activate the key factors in the skin to help improve the overall health and quality of the skin. Although the packaging may be small, it’s only made with 10 core ingredients without the use of purified water as a high concentration/ high strength delay-aging serum. This serum is an Epidermal Growth Factor (EGF ) and Fibroblast Growth Factor (bFGF) anti-aging product. Growth Factor ingredients help stimulates your skins growth and help repair, firm and strengthen your skin. The description states this is a night time product, but watching Wishtrend live Instagram feeds and videos, it seems that this can be used in the day time as well. Ingredients of Note ￼ image source This blue drop serum only contains 10 ingredients!! The first two listed are the growth factors ~ RH-Oligopeptide- 1 is an EFG and it is a Nobel Prize winning ingredient. This anti-aging peptide is a single chain protein composed of 53 amino acids and it is found naturally in our bodies, but it does decrease as we get older. Adding it to skincare products will help strengthen and repair the damaged skin barrier, while smoothing skin. RH-Polypeptide-1 is the bFGF and it is a naturally occurring growth factor found in the dermis of our skin. It helps enhance our skin’s density, strengthening and repairing it. It stimulates the cells in our connective tissue, called fibroblasts, that produces collagen, elastin and hyaluronic acid, improving your skin. Between these dual peptides, there is a total of 20 ppm and they keep your skin firm and smooth on both the uppermost and deeper layers of your skin. In the mid-20s, the concentration of EGF in the body decreases rapidly, and the amount of collagen produced in the skin also drops to 50%. 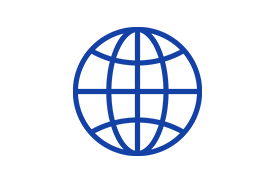 Ultraviolet light (UVA) that is inevitably absorbed every day penetrates deeply into the skin and destroys the essential elements of skin health, but skin with slowed production of EGF and bFGF can’t respond at the same rate as before. As a result, a decrease in skin elasticity is felt starting in the mid-20s and is noticed more in the form of wrinkles or decrease in firmness in the 30s. The Midnight Blue Youth Activating Drop has been developed for this exact period. I am a bit older than in my 30’s but this serum can be used at any age, so don’t let the sales pitch of your 20’s and 30’s throw you off. It is never too late to use anti-aging skincare. This also contains blueberry fruit extract, a powerful superfood antioxidant! Blueberries increase your skin’s elasticity and they are rich in vitamins A, B and C. The antioxidant phytochemicals will repair free radical damage, while preventing new damage from occurring. Blueberries strengthen blood vessels, repair broken capillaries, tones and firms the skin, while also treating blemishes ~ sounds like a great ingredient to me! Adenosine helps improve the reduction of wrinkles and is also an anti inflammatory. I read so many rave about this product from Beauty Korean bloggers before purchasing it. Honestly, I didn’t know what to expect, I was a bit afraid and was excited at the same time. My major concerned was, my skin is super sensitive and breakouts easily, I was afraid that this serum might cause me to breakouts. I started using it, by applying only twice in a week, I wanted to try it slowly and increasing the usage by time an see how my skin reacts to it first. Just after 2 times using it, I can see and feel my skin texture a lot smoother and brighter. I guess the skin repair does really work. Of course this might be because of my other skin routine too. I don’t have a prominent wrinkles but I do have fine lines on my forehead, I can say at least by incorporate this serum in my skin routine I can see faster result than my usual skin routine. At the label it stated that the serum works best at night, I haven’t try using this in day time so I can’t really say if it’s okay or recommended to use it in day time. Other than the result it has given me, I love how this serum is super lightweight, non - oily and absorb very quickly to my skin. The only thing that bothers me a bit, was this serum is watery almost like a toner. So I recommend drop it directly on your face and pat it all over your face asap before it slips away. This serum hasn’t caused me any irritation or breakouts despite my sensitive skin nature, so I’m very pleased with it. For the price of $30, I think it is reasonable as I can see the result faster than I anticipated.